AI Colors have several advantages over many traditional fingerprinting systems and can be used on their own or in conjunction with cyanoacrylate fuming to enhance contrast and durability of the fingerprint. AI Colors color the background rather than the fingerprint. Over time cyanoacrylate sublimes and sebum dries causing processed fingerprints fade. But because the AI Colors, color the background, the image of the print remains like a photographic negative long after the print itself is gone. In a practical study, samples fumed with the AI colors have retained the image of the fingerprints for five years and counting. AI Colors are a �hands-off� system decreasing the chance of contact damage to a fingerprint. AI Colors produce colored fumes which have little affinity for cyanoacrylate or skin oils. The fumes preferentially invade the polymer backgrounds altering the color around the print 2-3 shade units. AI Colors are available in a process range of colors that can be mixed to provide contrast against a virtually any color background including black and clear. Permaprint Axis Inversion Dyes are used in combination with traditional superglue fuming. Once a fingerprint is fumed and fixed. The Permaprint Axis Inversion Dyes are used according to the instructions below. 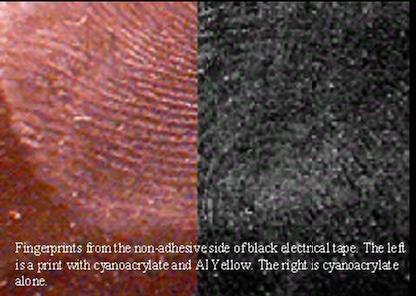 AI YELLOW is adds reflected color from 500nm to 700nm to substrates like black electrical tape. AI YELLOW is also available in an aqueous dispersion or powder form. Please send us a note from the Contact Us page or email to info@anevalinc.com if you are interested in purchasing this product. AI Colors are provided as aqueous dispersions that can be used in standard fuming chambers currently used in crime labs. If used in conjunction with cyanoacrylate, fume the fingerprint as normal then process with the appropriate AI Color as listed below. Shake AI Color to thoroughly mix the product. Add the desired amount to a vapor wand or heating tin. Add heat until color vapors form. Allow vapors to flow over the sample. Please click on the link to the right to order and test for yourself.